The majority of the test results for our first CF04 Big Y have arrived. Only the STRs remain to be released. As shown in this graphic, there's been a lot of movement on the Davis side of things. Ordinarily, we would not be interested in a line that is so distantly related (perhaps by about 1300 years), but it is the nearest match we have at present to the CF04 Cooleys. What we know about the Cooley SNP lineage come from, in large part, from that relationship. When we started to investigate this several months ago, Mr. Davis had a dozen ill-defined SNPs and the Cooleys were his nearest Big Y connection. We now know that only three of the SNPs had emerged in his lineage since after the birth of William Davis in 1658, on average about one per each hundred years. That there is only one SNP, A11236, directly related to William is very telling. We can date it either to William's birth or to one of his immediate predecessors. In other words, the mutation is no more recent than about 360 years. That's precisely the sort of timetable we'd like to see developed on the Cooley side. The ancestor of the Cooley tester is Robert Cooley (1754-1794), born about 100 years after William Davis. He belongs somewhere in that long, black line on the left, but until another Cooley tester comes along we won't know where. Does he go smack dab in the middle of the six Cooley SNPs? Was he born with four of them, the other two coming into the tester's lineage after Robert's birth? And if the tester does have just two "private" SNPs, which two? Genealogists love trees. A SNP tree is really no different from a genealogical tree comprised of human-relatable names. After all, these mutations first occurred with the births of specific men. Someone, for example, was born with the YP4945 mutation, and he passed it down to all his sons, they to theirs, and so forth up until the present day. Of course, YP4945 lived so long ago that we'll never learn what name he went by. But we call him YP4945. We've ID'd a portion of his genetic makeup, and we know that he lived in about the year of 650 AD. Certainly, he never guessed he would leave this kind of legacy, a gift really, for his descendants to ponder in the 21st century! In a sense, he's been resurrected, or at least his memory has been. In fact, we know a little something about YP4945's ancestry. I unveiled a view of the majority of the Cooley DNA Project in a SNP tree in article 32. CF04 is listed at the far right. Each SNP named above YP4945 represents a moment in a history — the moment of a man's birth. We know that S5301 emerged in Scandinavia about 4,000 years ago, and we know that two steps below that, in the cousin lineage, CF01, is SNP L448, known as the "Young Scandinavian" due to the mutations representation in numbers and its present concentration on the peninsula. We know that one of the latter SNPs below it, perhaps YP4248 or YP4253, crossed the North Sea into Scotland, possibly during the Viking Age. Judging from the tree at YFull, Robert Cooley's ancestor, YP4693 (born about 1350 years ago), was still a Scandinavian resident. What of these other six men, those direct and most immediate antecedents of the Cooley lineage? Will they be similarly resurrected? A Big Y is awfully expensive, especially if it's going to make a difference of only a couple of SNP values. But there's another way to parse through those SNPs. Yseq.net, the company that provides the names for "A" SNPs, can test all six of them at $17.50 each. For orders over $100 (and this would be one), they'll waive the $25 kit fee. The only hitch is that a new sample is required. To circumvent that problem, I've lately successfully arranged for individual SNP testing through FTDNA. That's more convenient for those folks who have a sample already on file. But it's $39 per SNP. In other words, rather than the $105 price through Yseq, a comparable test through FTDNA would be $234. The disadvantage with individual SNP testing is that it doesn't include a search for previously unknown SNPs, which Big Y accomplishes by looking at ten million positions on the Y chromosome. The means that individual SNP results can define a lineage only by the omission of SNPs, not by the presence of newly-discovered unique SNPs. Still, it's a step in the right direction. 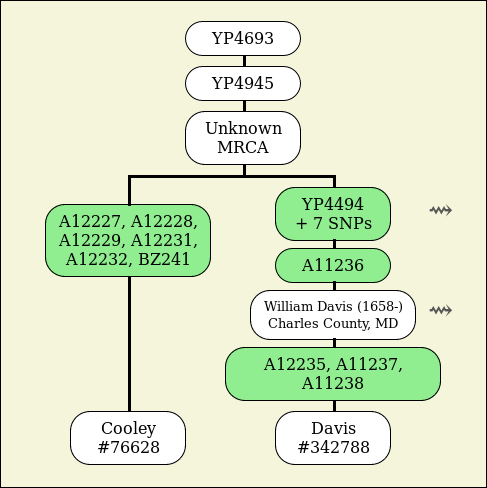 The Big Y not only extracts SNPs, it reveals nearly five hundred Short Tandem Repeats (STRs), those values that are shown on the results page for the Cooley DNA Project. Article 25 discusses the CF04 STRs shown on that page. The third illustration looks at genetic distance, the number of differences in STR markers, between individuals. For example, the descendants of John Cooley of Yorkshire and John Cooley of Oldswinford (both born in the 18th century) have a genetic distance (GD) of three. Judging from this table, Daniell of Maryland is an outlier, although certainly of the group. But unlike SNPs, STRs can be deceiving — the values can go up and down from one generation to the next. It's the overall trend we pay attention to. To that end, the more tests and the more markers observed, the better the "resolution" — or the recognition of the trend. But FTDNA doesn't report those STRs, and so the raw data file is presently at YFull. However, it now takes them several months to process STRs. Like the SNPs, though, we'll only have the Davis tester with which to compare the results. Genetic genealogy is all about comparative analysis. Find the differences between two samples, then attempt to explain them. With sufficient analysis, definitive statements can be made: The CF01 Cooleys are defined by the presence of a SNP called YP4491, the CF02 Cooleys (the Benjamin-ish crowd) by A12020, and CF04 by the presence of A12227. To go deeper than that — and we can go deeper — takes a greater number of samples. Without doubt, new testers will come along. The Cooley DNA Project has steadily grown since its inception in 2005. It will continue to grow and, eventually, future CF04 tests will provide better evidence about how the CF04 Cooleys are related to one another. Still, the group has a head start in that it's somewhat rare to have American testers who can trace their lineages to Britain. The CF04 group has two, which has given it a strong lead in learning the geographical origins of the family.